Oct. 12, 2012: Usually, waking up before sunrise is a good way to get a head start on the day. On Oct. 21st, waking up early could stop you in your tracks. Blame Halley’s Comet. Every year in mid-to-late October, Earth passes through a stream of dusty debris from Comet Halley, and the pre-dawn sky lights up with a pretty display of shooting stars. "We expect to see about 25 meteors per hour when the shower peaks on Sunday morning, Oct 21st," says Bill Cooke, the head of NASA's Meteoroid Environment Office. "With no Moon to spoil the show, observing conditions should be ideal." 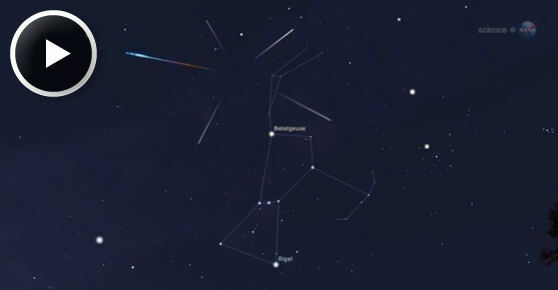 "The Orionid meteor shower isn't the strongest, but it is one of the most beautiful showers of the year," notes Cooke. The reason is its setting: The shower is framed by some of the brightest stars and planets in the heavens. Constellations such as Taurus, Gemini and Orion provide a glittering backdrop for the display. But that’s not all. This year, Venus and Jupiter have moved into position with Sirius, the Dog Star, to form a bright triangle in the eastern pre-dawn sky. On the morning of Oct 21st, blazing pieces of Halley’s Comet will cut straight through the heart of this celestial triad. Speed is important because fast meteors have a tendency to explode. Occasionally, Orionid fireballs will leave incandescent streams of debris in their wake that linger for minutes. Such filaments of meteor smoke twisted by upper atmospheric winds into convoluted shapes can be even prettier than the meteors themselves.